It goes without saying that both Sarkarai Pongal and VeN Pongal are inseparable and are complementary. In this posting VeN Pongal takes its rightful place! 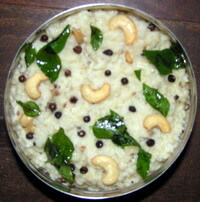 This is also made for Pongal Pandikai along with Sarkarai Pongal. Take a KadAi (wok, iluppaichchatti/vANali) and roast the mung dAl till it becomes golden colour and releases nice smell. Wash rice and the roasted mung dAl, cook them together with 4 cups of water in a vessel in the pressure cooker. For new raw rice the water should be 3 cups. After the cooker lets out 3 to 4 whistles, switch off the flame. Wait for a few minutes till the pressure comes down in the cooker. Remove the contents and mash them well with a ladle as to allow the ingredients mix well instead of remaining distinctly separate. Powder the black pepper and cumin seeds coarsely together. Heat the clarified butter moderately in a kadAi and after it is warm, fry the cashew nut to golden colour and then sauté the pepper, cumin powder with ginger pieces. Immediately add cooked rice dAl mixture to it with the salt and mix well without any lumps. Switch off the stove and remove the kadAi. Your veN Pongal is ready now. Note: (1) Those who prefer to add curry leaves, green chillies and asafoetida must add these along with the other items at the time of sautéing them, omitting cumin seeds. Remember not to powder the black pepper here but add it as it is by just frying in the ghI. (2) VeN Pongal goes well with PaRangikkAi (Pumpkin) SAmbAr or Vatral Kuzhambu. In Kerala they take this with coconut chutney. I will post the recipes for these later. Always roast or fry masAlA items/spices in low flame to retain the colour and taste of the ingredients. This entry was posted on February 19, 2011 at 11:43 am and is filed under Pongal with tags asafoetida, black pepper, cashew nut, chutney, coconut, cumin seeds, curry leaves, dAl, dhal, ghee, ginger, gram, green chilli, kadai, mung, pumpkin, salt, sambar, Sautee, vanali, vatral kuzhambu, Ven Pongal. You can follow any responses to this entry through the RSS 2.0 feed. Both comments and pings are currently closed.